22" adjustable up to 30" necklace featuring a NATURAL Arkansas Rock Crystal Cross Formation[VERY rare]with green and tan chlorite inclusions - and rainbows. There are record keepers and a tiny diamond window on the curved penetrator growing from its' base. Hand mined in Montgomery County, Arkansas. It named itself. 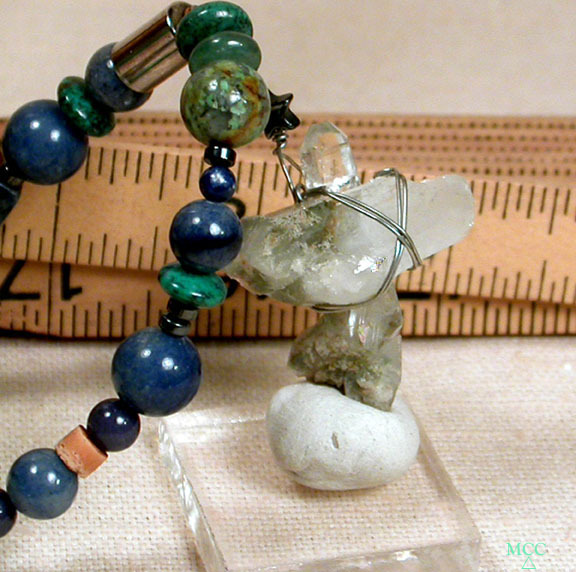 Double-stranded beading carries green aventurine, Chinese and African turquoises, blue dumortierite, sodalite, blue jade [dyed], hematite, a faience scarab, and wooden beads with a 2+1/4" oxidized sterling silver cross also set with turquoise. Healing and stylish for you.